Dean Martin and co-star Angie Dickinson in 1960’s Ocean’s Eleven. Today would have been the 96th birthday of Dean Martin, the King of Cool. Although Sinatra’s vision may have been for a more serious heist film, the presence of Dean Martin ensures that this time capsule of lounge-era cool kept things fun and lighthearted. After his brief introduction earlier in the film (where he sports a very sharp gray suit at the airport to be covered later), our true introduction to the Sam Harmon character begins at the Beverly Hills hotel as Sam provides a piano accompaniment to his own vocal rendition of Dino’s too-racy-for-radio hit “Ain’t That a Kick in the Head”. Definitely the most casual Rat Packer, as he even wore his tuxedoes with an informal button-down shirt, Dean Martin never let his laidback style get in the way of looking good. In fact, Dino shows a good example of how even a minimal sartorial effort can go a long way. Before heading to Vegas, Sam Harmon spends much of the heist-planning sessions in a sharp brown self-striped single-breasted sport jacket that he wears both with an open-neck shirt and with a tie. A jacket like this can be worn dressier with a tie or more casually without a tie. 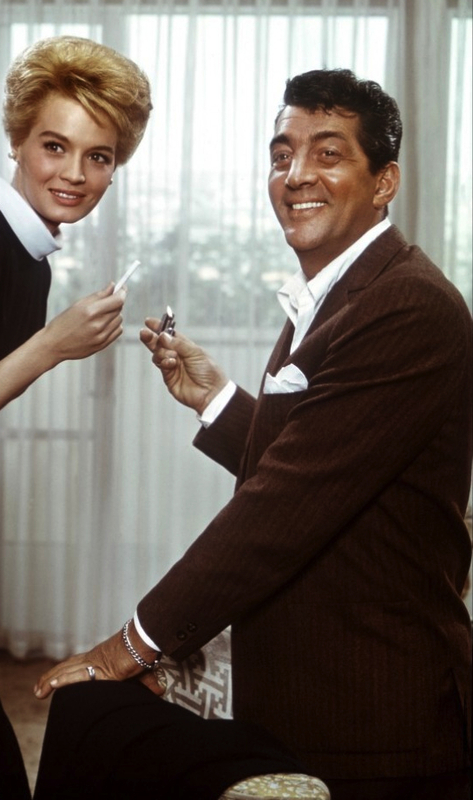 Also note that Dean Martin has a piano in his hotel room, mostly used for serenading a set of awestruck maids. The jacket hangs loosely and coolly around his frame with slightly padded shoulders that complement Martin’s athletic build. The moderate notch lapels roll to two dark brown horn buttons that match two smaller buttons on each cuff. The jacket has three patch pockets – two hip pockets and one breast pocket, where he wears a white linen handkerchief. The back has two short vents. Evidently, this type of jacket was a Dean Martin favorite, as he later wears a blue version in the film and can be spotted sporting the same type on some of his album covers. These jackets – and likely all of his clothing in the film – were custom-tailored for Martin by Sy Devore, the preferred tailor for the Rat Pack and many of their contemporaries. Dean’s choice of pants is a dark mink-colored pair of flat front trousers with plain-hemmed bottoms. Some men have to be careful when matching a brown sport jacket with earthy slacks, but Dean pulls this off especially well. Dean was probably just as comfortable in a sharp sport coat and slacks as Peter Lawford was in his terrycloth robe. Dino wears one of his usual white shirts with a loose, casual fit and a large button-down collar. White buttons fasten down a wide front placket and the wide barrel cuffs are buttoned on each wrist. For the later scenes at Spyros Acebos’ Beverly Hills home, Dean dresses up a little for his night of scheming with his old Army buddies. He adds a dark brown satin silk necktie, very much a 1960 style with its narrow width and relatively short length. The tie is primarily brown but with three small rectangles – white, black, and white – sparsely scattered down the front of the tie. Strangely, a few shots of Dean in this scene show him instead wearing a darker block-striped tie with blue and red tones. This tie will later be featured in another scene where Dean wears the blue version of the brown striped jacket. Dean also wears this tie for the funeral scene finale. Its appearance in this scene is just a continuity error. Left: Dean in the brown tie worn for most of the scene. Right: Dean now sports a dark block-striped tie when he’s surrounded by his team. What gives? Dean’s footwear in these scenes are a pair of dark brown leather three-eyelet plain-toe derby shoes, worn with a pair of very thin black silk socks. Dean tends to accessorize with a cigarette and a glass of whiskey, and Ocean’s Eleven is no exception, but he also adds the fashion flourishes of a silver pinkie ring and silver chain-link bracelet, both on his left hand. These early scenes are the best reflection of the real Dean Martin’s character: a romantic crooner with a few vices of his own (notably smoking and drinking very heavily) but a reluctance to go along with the rest of the Rat Pack’s debauchery. While Frank and Sammy would be rounding up girls for all-night orgies, Dean – the closest thing the group had to a family man – would refuse to participate and head home. Although he wasn’t the perfect example of a loyal husband, Martin was much more discreet with his comparatively minimal affairs. His longest marriage, to his second wife Jeanne, lasted 24 years and – although he briefly left her for a younger woman in the 1970s (a decidedly sleazy era anyway) – they reconciled later and remained friends until his death. Also, Dino refused to have any association with Frank and Lawford’s Mafia cronies, despite allegations that he was linked to the mob early in his career. Although no mention is specifically made of orgies and the mob in Ocean’s Eleven (for obvious reasons), Dean’s character is the one who is most reluctant to take on the heist, instead suggesting that the group finishes their drinks and goes home – likely something the real Dino would have said after a wild suggestion from Frank. Glad the title clears it up. If you’re looking for something to listen to that will keep you in the right sort of swinging mindset, pick up Dean’s aptly-titled 1958 Capitol album This Is Dean Martin! Besides the rather obvious title, Dean dons a sport coat on the album cover very similar to the one he wears in Ocean’s Eleven. The track list, which includes “Volare”, is comprised of some of Dino’s most popular songs – a series of lighthearted and romantic songs with an Italian flair. Dean slips from cocktail to cocktail in the film, in accordance with his stage persona. He typically drinks whiskey highballs, a good drink for keeping your whistle wet all day long without getting too messy. Dean (or Sam, if we’re talking about his character) has the hotel room of Rat Pack dreams – a fully-stocked bar and a piano for serenading the bevy of attractive maids who coo at each note. If your hotel room doesn’t have a bar and a piano, it’s time to change hotels. He also smokes unfiltered Lucky Strikes, the brand of choice for people ranging from old time movie stars Gary Cooper and Myrna Loy to fictional characters such as Don Draper and Gator McKlusky. According to Lucky Strike’s ad campaign, even Santa Claus lit up Luckies. Just remember that a gentleman always lights a lady’s cigarette first. Dean dressed simply but grandly. A few accessories here and there liven up a casual and cool look. 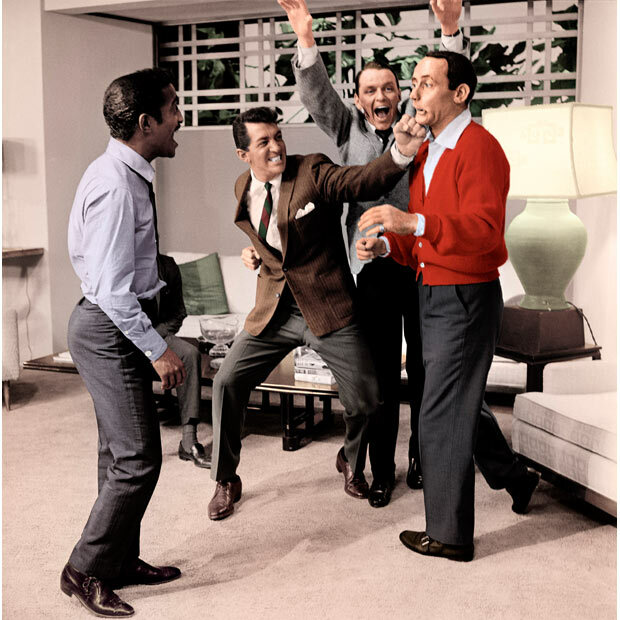 Dean sports the continuity error tie while clowning around with the Rat Pack on set. Check out the movie . 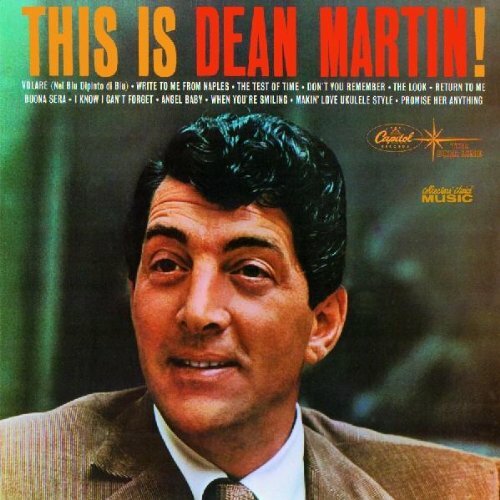 Go ahead and pick up a copy of This Is Dean Martin! while you’re at it. Old times are only good when you’ve had ’em. Great write-up. Sinatra may have had the better voice, but Dino had the better everything else. Hey pallie, likes what a totally totally stunnin’ly swank post in homage to the greatest style icon of all times….our most beloved Dino….and how cool for you dudes to have shared in on the day of our great man’s great entry onto our planet. Know your radiant reflections are bein’ shared this day with all the pallies gathered ’round the ilovedinomartin waterin’ hole. Thank you! You have a terrific blog that would certainly make Dino proud – enjoy! Hey pallie, likes Mr. luckystrike721….thanks for those most gracious words of Dino-appreciato…ilovedinomartin’s true purpose is to honorin’ our most beloved Dino. Hopes to find more Dino-honorin’ posts at your swankest of swank blogs.